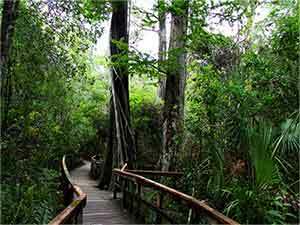 Designated as a National Natural Landmark by the National Park Service, the Big Cypress Bend Boardwalk within Fakahatchee Strand Preserve State Park takes the visitor back into a tiny slice of the virgin cypress forest that was miraculously spared from logging. At 2,200 ft long, it weaves in dappled light through 500 year old bald cypress, three feet or more in diameter, under a canopy festooned with bromeliads and past trunks wrapped by ancient strangler figs. Other trees include stately royal palms, cabbage palms, pop ash and pond apple. Pickerelweed and alligator flag grow in the swamp bordering the Boardwalk. 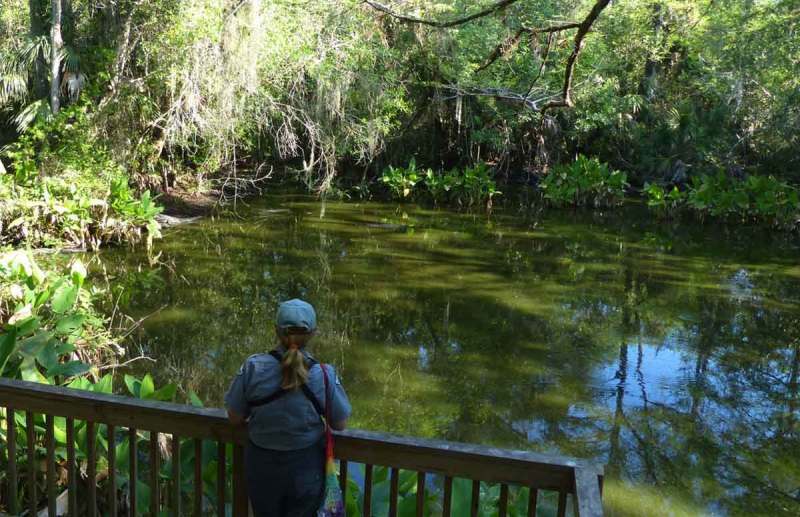 At the end is an alligator hole where visitors will frequently spot wading birds as well as alligators. Along the way there is an active bald eagle nest. Visitors will frequently see pileated woodpeckers, barred owls, butterflies, anoles and various water snakes. A stroll along the boardwalk is a memorable encounter with the Fakahatchee. The Cypress Bend Boardwalk expansion project will increase the access to some of the Park’s most characteristic landscapes. This is a regular stop on the “Everglades tour trail”. Our vision is to create a sense of place and a world class destination whose lack of amenities do not detract from the natural resource. It is our expectation that this will become a jewel within the Florida Park Service system. To accomplish this the Boardwalk development plan calls for a deceleration lane and new parking area with a fee collection entrance, picnicking area and modern restrooms. This will be built on an old section of the highway left over from when it was straightened. This is located 375 yards east of the Indian Village and current ad-hoc parking area on the same, north side of the road. Additionally we intend to re-build the deteriorating Boardwalk and expand its capacity by adding a loop with elevated viewing sites around a scenic lake on the routes to and from the proposed new parking area. Along the way there will be a number of rest stops and rain shelters each of which will have been situated for a particular interpretive purpose. Where possible natural resources will be interpreted in the open air and cultural resources within these shelters. Our vision also includes interactive displays with QR coding. The wet prairie between the original Boardwalk and the new parking area will be accessed by a foot bridge to be built across the canal that parallels Highway 41 and borders the new parking area. There is a limited footprint for the amenities in the new parking area. Depending on how far the restrooms and picnic shelter in the parking area project out over the canal, the bridge may also be able to serve as a wildlife viewing area. The bridge will lead to an interpretive pavilion nestled on the prairie. 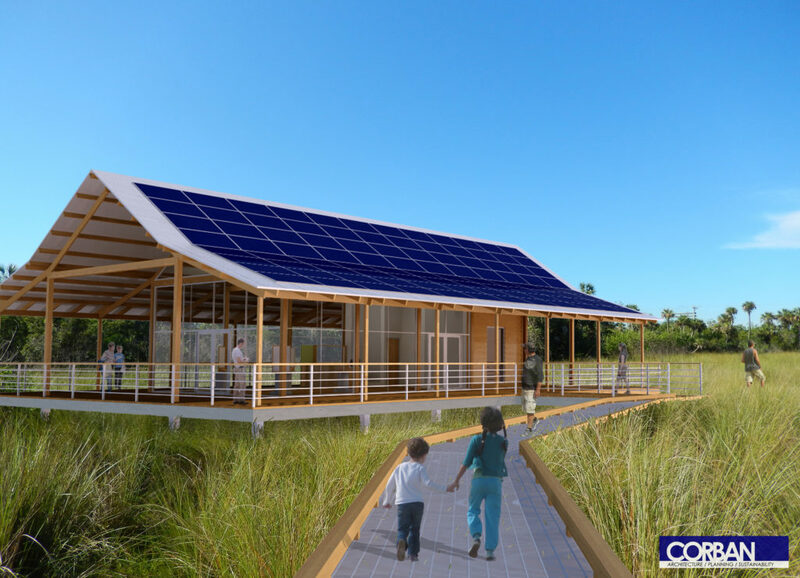 Digital rendering of the proposed Fakahatchee Strand Interpretive Pavilion. Placing the pavilion across the canal gives people the opportunity to experience the Fakahatchee, if they choose not to walk the boardwalk. This rendering by Corban Architecture shows how an observation platform on a canopy walk could increase access for all. 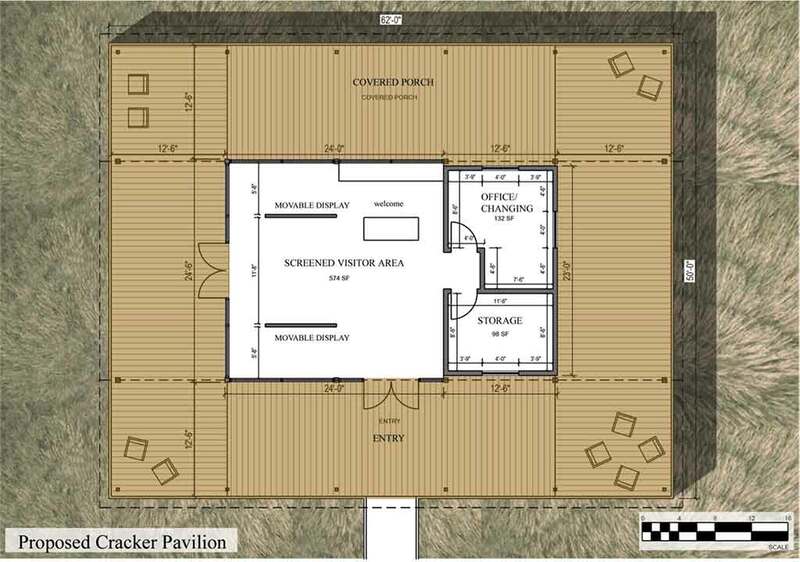 Draft floor plan of the proposed Fakahatchee Strand Interpretive Pavilion. Click on the diagram for a larger view. Its interpretive content will be designed to inspire visitors to walk the prairie, lake and strand swamp, but for those who are not up to that level of activity they will be able to sit in a rocking chair on the shaded porch and just take in the view. By positioning across the canal on the prairie rather than in the car park it will provide visitors an opportunity to experience part of the Fakahatchee, even if they can’t walk the entire Boardwalk area. The visitor center will be a multipurpose building whose contents will inspire further exploration. Apart from helping to explain the significance of the natural resource and its history, the same space will serve as a refuge, a place of contemplation, a meeting and gathering space, and most importantly for the first time provide a place where FOF and the Park can present interpretive and educational programs to the public. FOF Volunteers Patrick Higgins and Steve Koreny erect the first of two new signs launching our Big Cypress Bend Boardwalk expansion project appeal. One is located where tram tours start on Janes Scenic Drive, and the other is at the boardwalk site. The signs share our vision for the expanded site and encourage visitors to donate to help us realize it. Each sign features a QR code that brings up FOF’s website project page on a smart phone. Tech-savvy guests can immediately learn more and make a donation on-line. FOF volunteers started planting out orchids and bromeliads along proposed Epiphyte Walk route. This project will be the largest undertaking the Friends of Fakahatchee have ever done and will leave a lasting heritage for generations to come. However there is no nearby large population center to draw upon for support. We are almost 1 hour from Naples and 1 ½ hrs from Miami, and there are lots of worthy competing iconic causes in Collier County like the Zoo, Botanical Gardens, Nature Conservancy, Rookery Bay, Corkscrew Swamp, CREW, etc. Tom Maish, Chair of the Boardwalk Vision Committee at tommaish@aol.com or Patrick Higgins, FOF President at higginspjc@gmail.com. Your generous contribution will support the renovation of our famous boardwalk. Your dollars will build the Fakahatchee Strand Interpretive Pavilion providing access and unforgettable experiences for visitors to the Fakahatchee. Read about the evolution of the Boardwalk Expansion Vision, and follow along to see how Park Staff and the Friends of the Fakahatchee are making this vision a reality. Although the Boardwalk Expansion Project is our current focus, other projects require constant attention by the Friends of Fakahatchee. An annual slough survey is conducted in March, and members of the committees and other FOF volunteers assist biologist data collection. 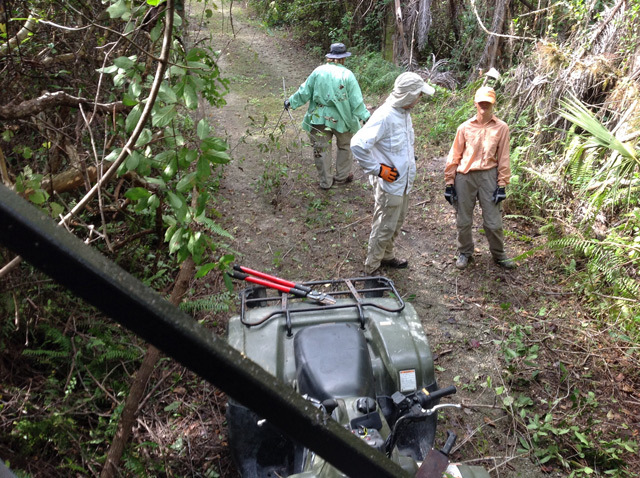 They locate, identify, and count the rare and endangered plants, trees, orchids, bromeliads and grasses. Last year a Prairie Hammock Survey was added to provide data for input into the Park’s Burn Zone Map. Hammocks containing oaks are of particular interest because their acorns are an important food source for white-tailed deer, which in turn are the favorite prey species of the Florida panther. Read more about the Prairies in “Taking Stock of Fakahatchee’s Priaries” by Patrick Higgins. It is unfortunate that our fascination with orchids has resulted in their decline. “Poachers” of rare orchids have reduced the diversity and abundance of the orchids in the Fakahatchee strand. However, there is hope for their protection now and in the future with help from the Friends of Fakahatchee. 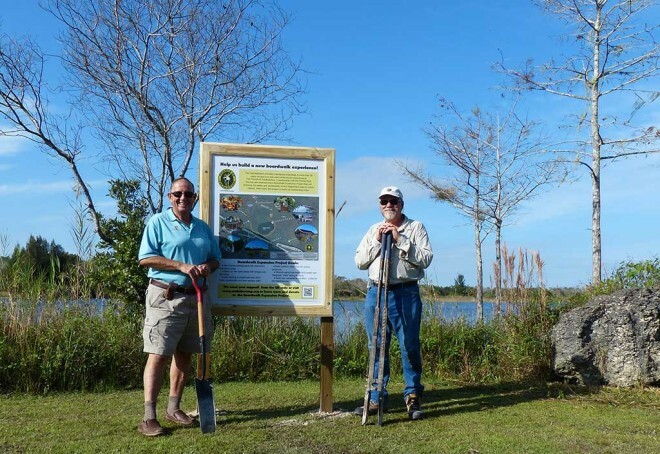 In 2007, Park Biologist Mike Owen and Dennis Giardina, Everglades Region Biologist for Florida Fish and Wildlife Commission, entered into collaboration with Matt Richards from Atlanta Botanical Garden to experimentally restore rare and endangered orchid species at Fakahatchee Strand Preserve State Park. Restoration of the cigar orchid, Cyrtopodium punctatum is quite a success story. Once propagated and brought to size, the Friends helped disperse the baby orchids throughout the park to help ensure their survival. Polinated seed pods were also returned near where they were collected and hung where the thousands of dusty seeds could disperse naturally on wind currents. A handful of cigar orchid seedlings in Fakahatchee germinated from seed in the wild. Restoration efforts continue! As part of FOF’s mission to preserve the unique ecology of the Fakahatchee we train our volunteers to record and report suspicious activity and fund the installation and maintenance of a network of hidden cameras to guard against illegal plant removal. Florida’s sixteen species of native bromeliads (airplants) are at risk from attack by Mexican bromeliad weevil. The dramatic giant airplant, Tillandsia utriculata, is particularly sensitive to the weevil. Unfortunately, the Mexican bromeliad weevil continues to move through the Fakahatchee Strand. Read more about this in “A Window on the Strand,” where Patrick Higgins discusses the giant airplant’s susceptibility. The best hope for our bromeliads may be their isolation within the swamp, and the possibility of a genetically resistant strain within the population. Under the guidance of Park Biologist Mike Owen, around 120 of the Fakahatchee’s healthy giant airplant, Tillandsia ulriculata, population were harvested and placed in the care of the Naples and Selby botanical gardens for safekeeping. The plan is to return the plants to their original placement once they develop flower spikes so that their seeds can be naturally distributed. On November 13, 2014, 16 Giant Air Plants were ready to be returned to the Fakahatchee. Using the data gathered, they were returned to as close to the same tree, height, and distance from Janes Scenic Drive that they originated. For more details read “Restoring the Giant Air Plant“, where Mike Owen and Karen Relish provide an exciting update on this ambitious project. Volunteers help keep the trails clear and mop up the invasive exotic plant species while they are at it. The park has approximately 32 miles of roads and trams to maintain, and the Friends assist the Park in maintaining the front portion of Janes Scenic Drive so it is accessible to tram rides and hikers. Throughout the year, volunteers clear the trails and assist the park with vehicle and equipment repair. Consider a generous donation to the Friends to put more tools in the hands of these hard-working volunteers! 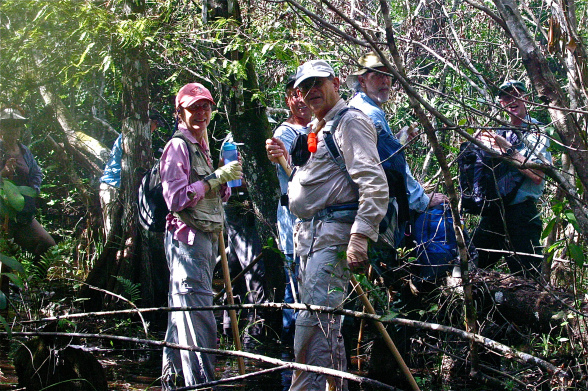 The “Faka-Hackers,” intrepid volunteers all, each year clear the East tram for the February Everglades Ultra Marathon, which also makes the trail more passable for hikers. This annual effort is made more difficult by the proliferation of the very aggressive, invasive non-indigenous, invader of the hammocks, the dreaded Schinus terebinthifolius, commonly known as Brazilian Pepper. Control of this pest along the trams is an ongoing project.